One of the funniest sensors to use for sound manipulation. it can be used by moving a hand up and down in its radius of action, so as to control a parameter from a maximum to a minimum value; the Dart controller can also use it as a trigger / button or even to play note scales. this example shows the Dart_Editor view of the default DART_ONE preset. The GP2D ITEM has been selected (enlighted in blue). The selectors appearing in the settings-box on the right of the screen are used to set the distance sensor. DATABYTE1- the value of the Data_Byte_1 – in a Note message it will be the Note-Pitch value. MIN/MAX – the value range of the Data_byte_2 can be varied and inverted. 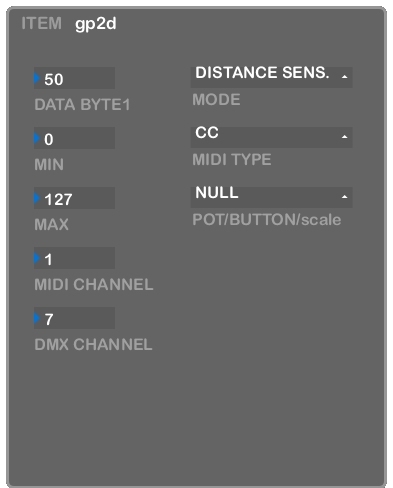 DMX CHANNEL – The channel of the DMX output produced by the sensor action. 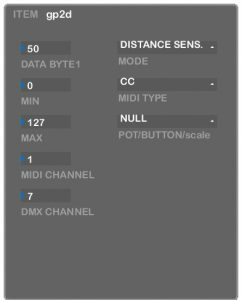 MIDI TYPE: the distance sensor is commonly set to Control Change or Pitch Bend. 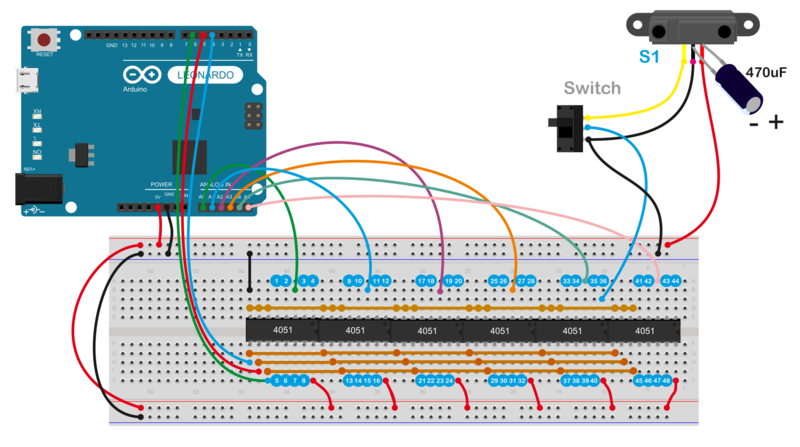 0 – POT_mode : the distance sensor produces a continuous MIDI output flow, as a potentiometer. 1 – BUTTON_mode : the sensor emulates an ON-OFF switch, distance will regulate the data byte 2 (velocity) of the MIDI signal – the MIDI-type selector should be set to NOTE. 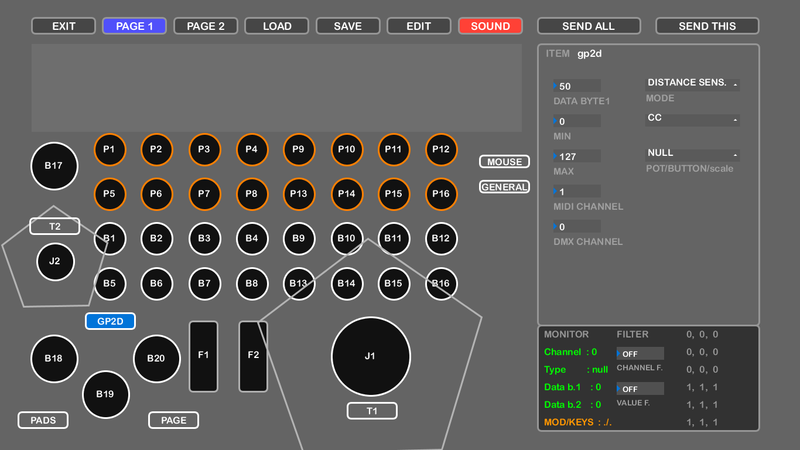 2 – SCALE_mode – the sensor will control a glissato sequence of notes, following the scale that has been set or recorded by one of the spinners (in case they are set in scale mode) – the MIDI-type selector should be set to NOTE. 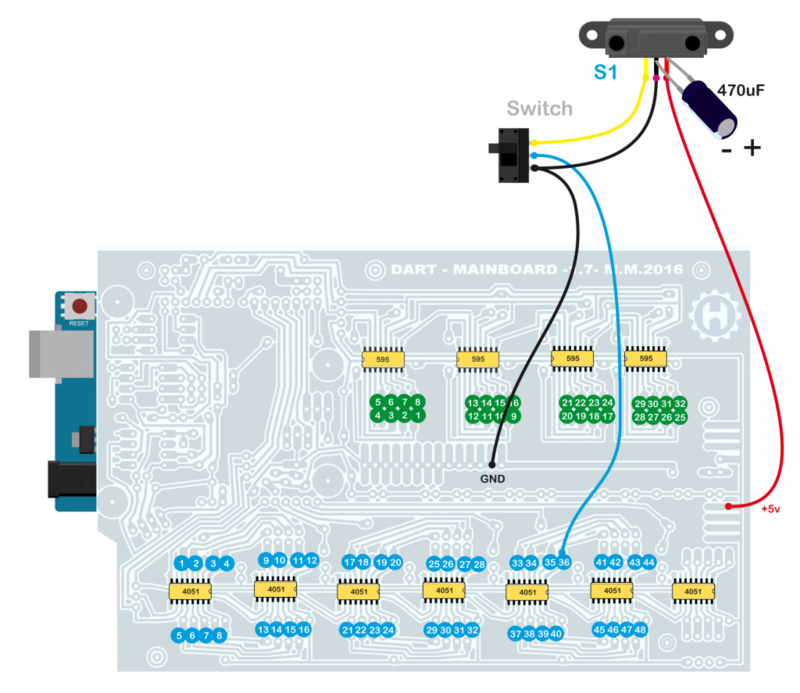 In the following illustrations you can see that the sensor used is a SHARP GP2Y0A21. 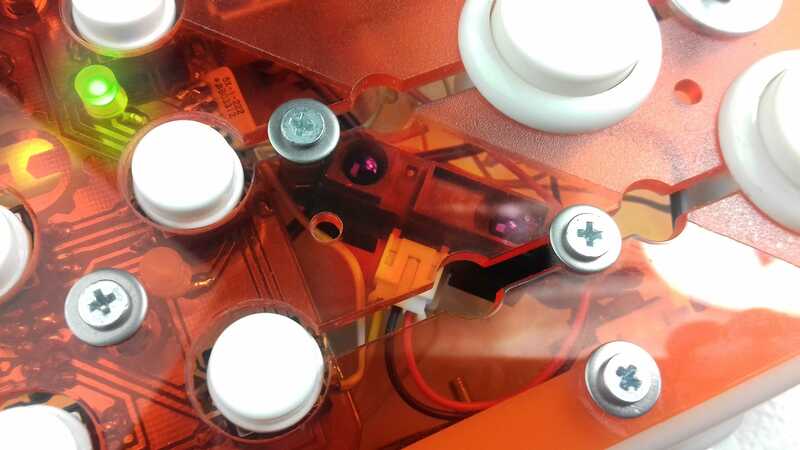 A 470uF electrolytic capacitor has been mounted very close to the sensor power supply input, because, based on our experience, this helps to stabilize the signal. Another useful addition is the activation switch, to disable the sensor when it should not be used, and avoid producing unwanted MIDI signals.